So I had the joy of getting my very first Fairyloot box for the month of August! This is a monthly subscription based box filled with bookish goods. I was super excited for it and I am so overjoyed with how amazing it was. This blog will talk about and show the items that were included in the August Fairyloot box! 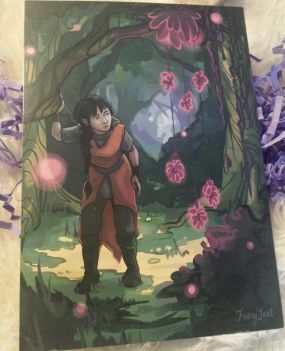 Before I talk about this months Fairyloot box, let me first explain a bit about what it is! 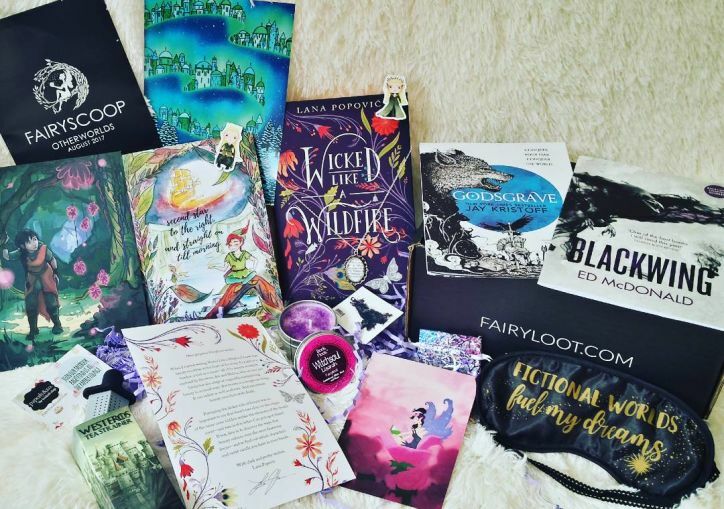 Fairyloot is a monthly subscription box packed with a variety of bookish goodies plus a book of the month. Every month, a theme is selected and every item that’s included within revolves around that. 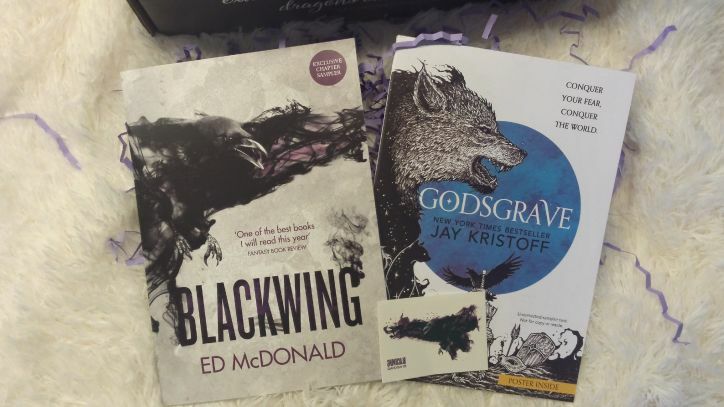 Fantasy Young Adult / Young Adult style books are selected mainly for Fairyloot, which is perfect for me – I love YA Fantasy books! The majority of items that are included in every box are exclusively made for Fairyloot. That means that you will not find them anywhere else! Even though Fairyloot is primarily uses a subscription based program, it is also possible to single purchase boxes whenever they become available. That is what I done for the August Fairyloot box! The Otherworlds card talking about each item! The theme for the month of August was called “Otherworlds”. This box would include items from other fictional worlds or worlds that are within our own world! If you were a fan of A Court of Mist and fury, Game of Thrones, Lord of the Rings and Peter Pan, you would LOVE the “Otherworlds” box! 6 items would be included within the August Fairyloot box. Some of these items have been exclusively made! The book of the month for August would feature a dark, magical, bewildering novel that is set in Eastern Europe. Witches, sisterhood and love would reside within, a very fitting setting for “Otherworlds”! Now the moment you’ve been waiting for. Here are all the items that were included in the August Fairyloot Box! I LOVE THIS CANDLE SO MUCH! 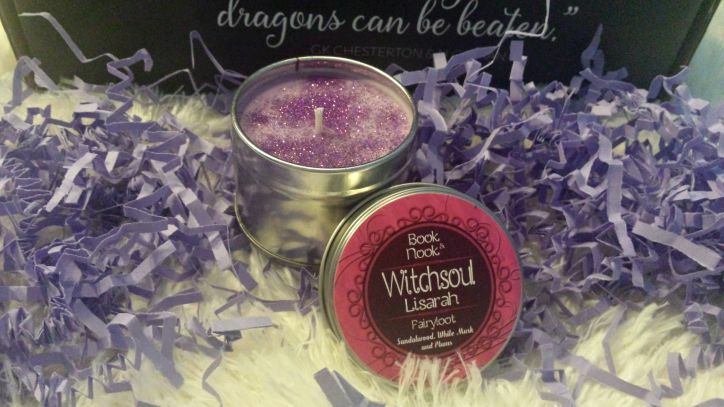 The first item from the Fairyloot box was an exclusive Witchsoul Candle created by Book and Nook! The candle is themed together with the book of the month. In total, 5 different candles were sent (or scent? eh? eh? I’ll see myself out) out based around 5 of the characters from the book. The candle that I received was the Witchsoul Lisarah one. The scent is Sandalwood, White Musk and Plums. I love it so much! Sadly I have no idea if I’ll ever light it, it looks so pretty unlit. Purples and pinks, my favorites! It is super comfy to wear. 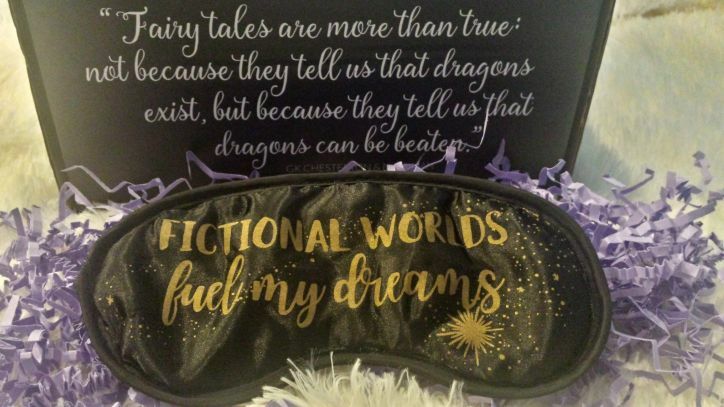 The second item created by Fairyloot was a satin sleeping mask! The lettering on the front reads ‘Fictional Worlds fuel my Dreams’. The writing is a beautiful gold cursive and is surrounded by dreamy stars. It is beautiful and soft and perfect for sleeping! The Westeros Tea Strainer. I really look forward to trying it out soon. 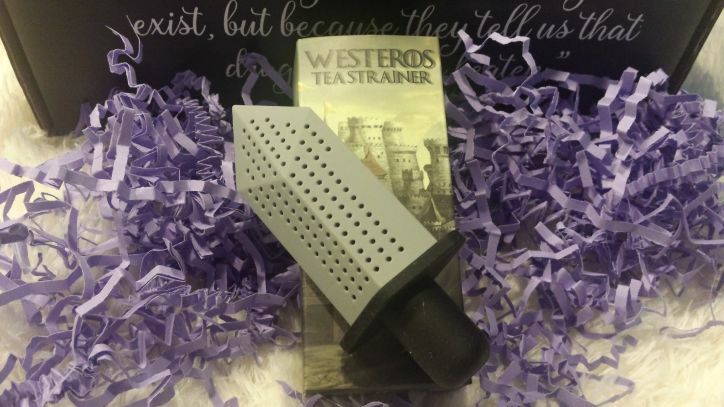 The third item in the August box was an exclusive Westeros Tea Strainer. This was another item brought from Fairyloot! The strainer comes in a beautifully designed Westeros box. The tea strainer itself is shaped like a dagger. It is perfect to put loose leaf tea in to create the perfect cuppa! Now I have an excuse to buy loose leaf tea, bonus points! The fourth item which was designed by Paperly and Co were two exclusive Lord of the Ring Magnetic Bookmarks! There were 3 different sets of two that were sent with this months box. Legolas and Thranduil who represent Mirkwood, Samwise and Frodo for The Shire and finally Aragorn and Arwen for Gondor! 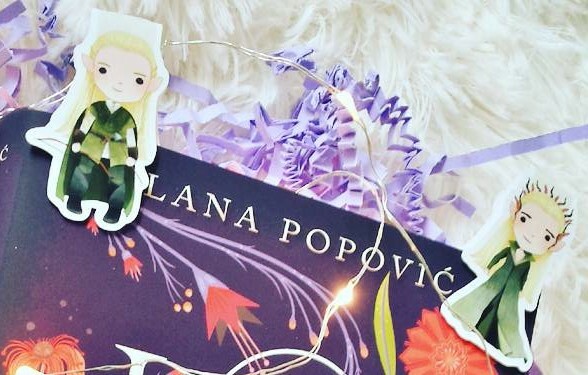 The bookmarks that I received were Legolas and Thranduil. I was super excited by this because Legolas is one of my favorite characters! The bookmarks are perfect for keeping my place in a book. I am currently using Legolas as my bookmark for my current read! The writing inside of the notebook. The fifth item was a beautifully created Neverland notebook. The design was by TJ Lubrano. 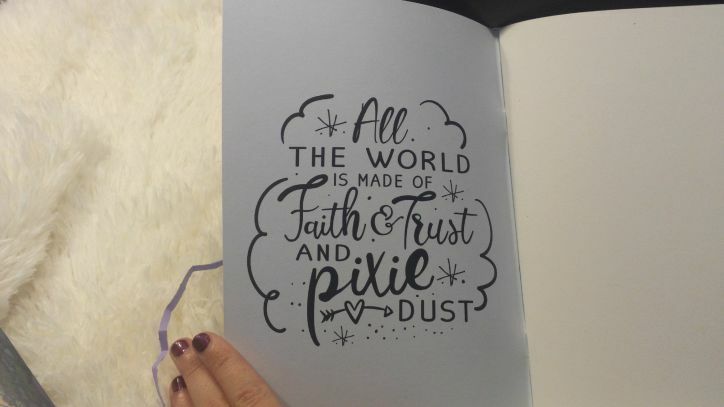 The iconic saying “Second star on the right and straight on till morning”is written on the front and on the inside of the cover, “All the world is made of Faith & Trust and pixie dust” is written with beautiful lettering. I adore this notebook, but much like the candle, I don’t know whether or not I will be able to ever write in it. It’s just so beautiful, I don’t want to ruin it with my writing! Inside an incredibly stunning string bag, the sixth item lay waiting to be unveiled. An exclusively designed for the Fairyloot box, a handmade Velaris Pendant Necklace created by Oh Panda Eyes. 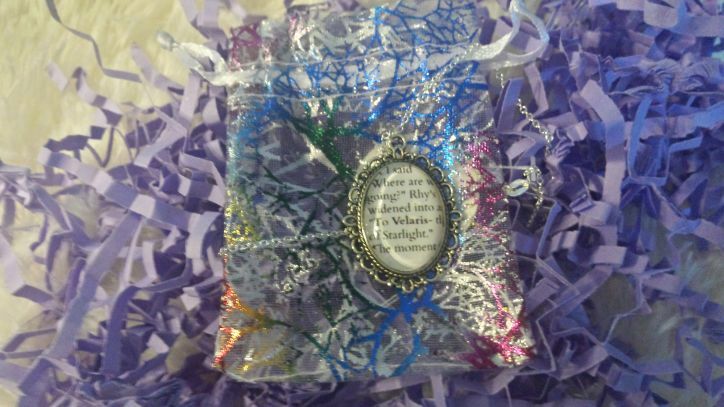 On the pendant, there is a quote from the book A Court of Mist and Fury by Sarah J. Mass. The quote refers to a magical city of Starlight: Velaris. Very fitting for the otherworlds box! Now it’s time to wrap up the main meat and potatoes of Augusts Fairyloot Box! 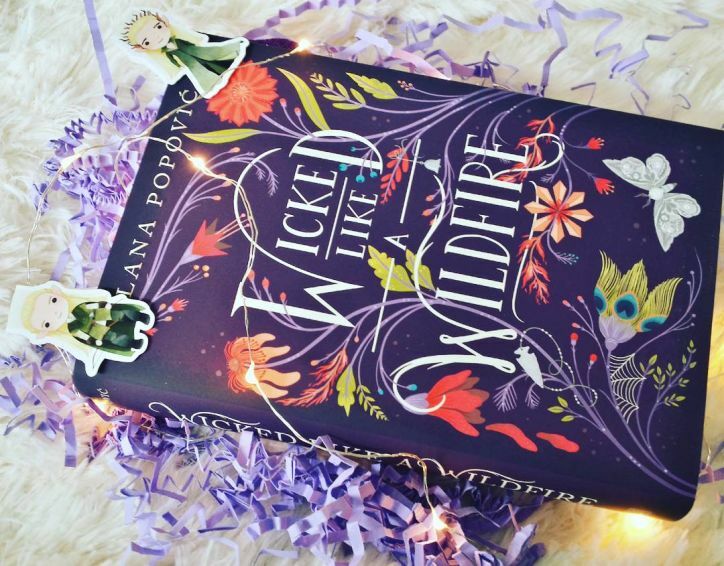 The book that was selected for the Otherworlds box was Wicked Like a Wildfire by Lana Popović. The book has witches, fiery females,romance and whole load more! The cover of the novel is a beautiful purple color filled with flowers and laced with gorgeous lettering. It is definitely a book that I really look forward to reading at some point in the future! The extras included inside this months Fairyloot box! Some extra things that the Fairyloot box included was a sampler of Godsgrave that when folded out becomes a beautiful poster. A sampler of Blackbird that came together with a little Blackbird temporary tattoo. Finally, a discount code for Mini Backdrops. This is incredibly handy for people who use backdrops for things like Instagram, so it will be something I look into! Everything inside the box! Included here is also a beautiful art piece and a letter from the author. I knew from the moment my confirmation email for the box came through, I would be in for a treat. For the longest time, I have wanted to try a bookish box. 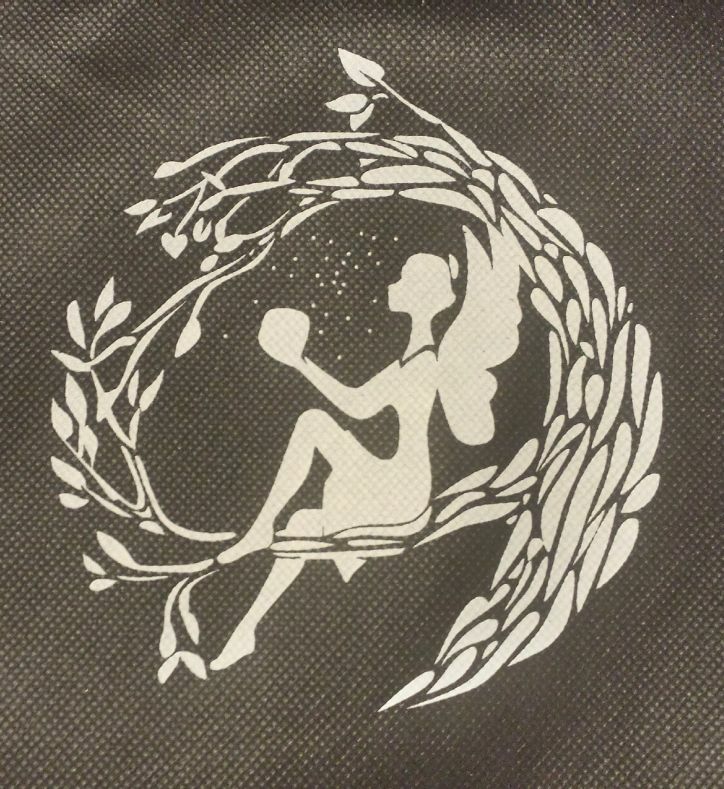 I am so happy that Fairyloot was my first. Every single item that was inside the box was fantastic. Highly crafted and gorgeous! The book that was also included was one that sounds interesting and will for sure be something I read in the future. Overall, I am incredibly impressed and happy with Augusts Fairyloot box. I am really looking forward to seeing what other goodies are in store with their boxes! If you are interested in checking out Fairyloot, follow the link to their website here! 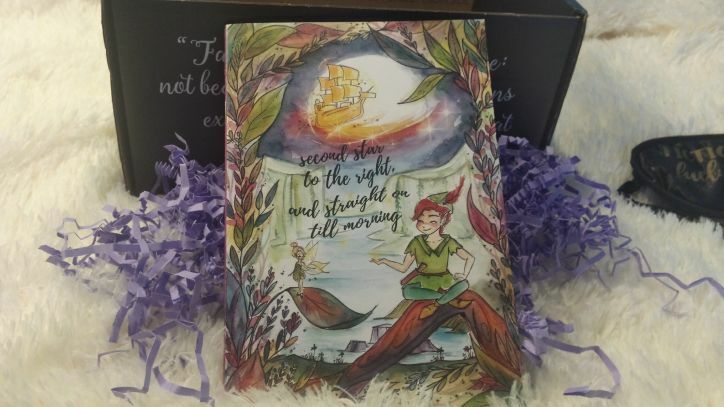 Have you ever received a Fairyloot box? Or any bookish loot box? Let me know in the comments below! That’s actually super cool. But you know what you can do in that notebook? Calligraphy! Next Next post: I HAVE A JOB!